Recently I quilled a marriage certificate for a lovely couple in Virginia. Kristyn, the bride-to-be, asked if I would also design a flower with quilled embellishments that she could wear in her hair. It wasn't something I had done before, but there's nothing like the desire to please someone who has confidence in your abilities! You might remember Jenny Jafek-Jones of The Crimson Poppy, who was featured on All Things Paper last spring. Since Jenny creates beautiful paper flowers and had immediate access to high quality crepe paper, I recommended that Kristyn contact her to make the ivory blossom. I then added single and double scrolls in silver and silver-edged ivory quilling paper, and alternate side loop leaves in silver-edged green. The colors coordinated with the couple's marriage certificate. Here's Kristyn on her wedding day... I love this picture. There are additional images at the website of photographer, Jeff Greenough. (Go see! I think you'll enjoy them.) If you look closely at the very last one, you can catch a glimpse of an easel holding the certificate... more about it later in the week. OH I think it is simply beautiful! Love the fact that it is all made of paper. It makes it unique and something to cherish! I have been following you for awhile and I think this is the first time I comment. This post made me really happy for some reason. I think your work is amazing and I plan on taking up quilling some day. Quick question, did you apply something to the paper to make it more durable, resistant? what a beautiful bride and that hair accessory is gorgeous. That is absolutely gorgeous! Great job, Ann! Wonderful wedding photographs, and the hair accessory is lovely. I especially like that no one else would have one like the one the bride wears. She could even frame it as a keepsake. Paulina, nothing was applied to the paper to make it more durable. The flower is actually quite forgiving, as the petals can be fluffed and reshaped. As for the quilling, barring being completely crushed or folded, the scrolls have a good bit of elasticity and can be reshaped pretty easily. Wow Ann this is absolutely gorgeous and how special to have something so unique and handmade with such care. That is absolutely gorgeous! And what a stunning photo of Kristyn. WOW!!!!!!!!!!!! Gorgeous Ann!! The leaves and the scrolls so beautifully done . It looks so pretty worn that way. this is wonderful, Ann! very elegant & the color is beautiful! ohh it's gorgeous! the quilling is perfect for the flower! that dress is a knockout, what an incredible picture. Terrific! Ann, your quilling perfectly complements the crepe paper flower. Fantastic, I love the detail in the leaves. This is a really beautiful piece. That is amazing! Simply gorgeous! What a beautiful bride (so is the groom). Thanks a lot for sharing such amazing job!! Came across this fabulous bridal hairpiece that you made on another blog that featured your work...and was immediately captivated! Such a delicate and stylish craft. So I just had to come over and visit your blog. Goodness all of you! Thanks so much for visiting and commenting. Paulina, one other thing I forgot to mention. I strengthened the quilling paper by doubling all of the strips... glued two back to back. This is what makes them extra springy. That is an exquisite hair accessory Ann! I love the whole effect!! 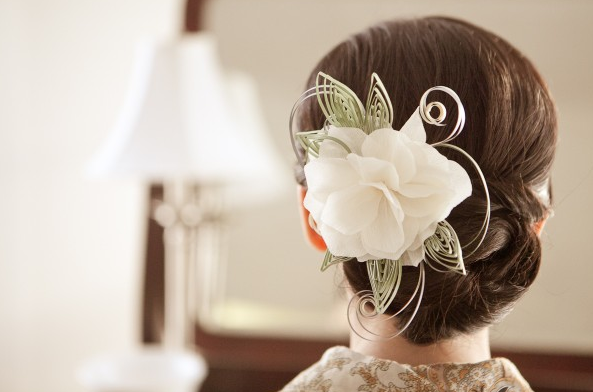 The hairpiece is wonderful and what a fantastic keepsake!! 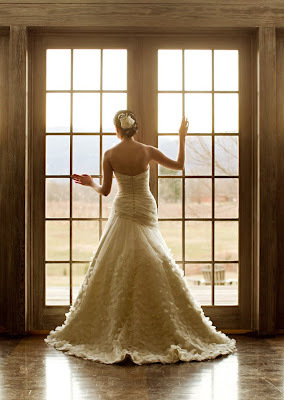 Kristyn wears it just beautifully as she does that gorgeous dress!!! The photos are great,'love those shoes and what a venue!! You've excelled!! Elegantly stunning and yet another pioneering application! This is such a beauty, Ann! I've passed on a stylish blogger award to you on my blog. The bridal hair accessory is gorgeous. You both have an exceptional eye for elegance.